Cook Memorial Library does it again with a first place ribbon for their 4th of July float. 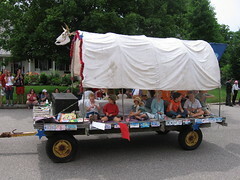 Amy, the Children’s Librarian led a dedicated group of volunteers to put together the Read Across America covered wagon. Kudos to Amy for her unending energy and hard work, Diane for her great banners, Peter for the saplingshe cut and use of his driveway, Bob for his muscle and cow skull, and all the kids who came along for the ride. Click here to see a YouTube video of the parade filmed by Sharon Malenfant.